Sometimes the swan's voice does not sound so sweet. Disney Epic Mickey is one of my favorite Wii games. Despite the critical complaints, I always saw Epic Mickey as a game bursting with great design, passion, creativity, and potential for a legendary sequel. Well, Disney Epic Mickey 2: The Power of Two has finally stepped up to the plate, and it promises to be a musical comedy with an excellent co-op experience. Sadly, if the critics weren’t right before, they certainly are now. The plot of Epic Mickey 2 takes Mickey Mouse back to Wasteland after a desperate call for help is sent from the Navi-like Gus the Gremlin. Earthquakes are spreading throughout the land, and then-antagonist Mad Doctor is back, eager to lead the Wasteland clean up and give up being a villain. As expected, things do not go as planned, and a little mouse is left to re-save Wasteland. The story is okay, but it is just a bit too predictable. The big addition to the game is that Oswald the Lucky Rabbit is playable right alongside Mickey. The first player always controls Mickey Mouse, and either a second player or an AI controls Oswald. 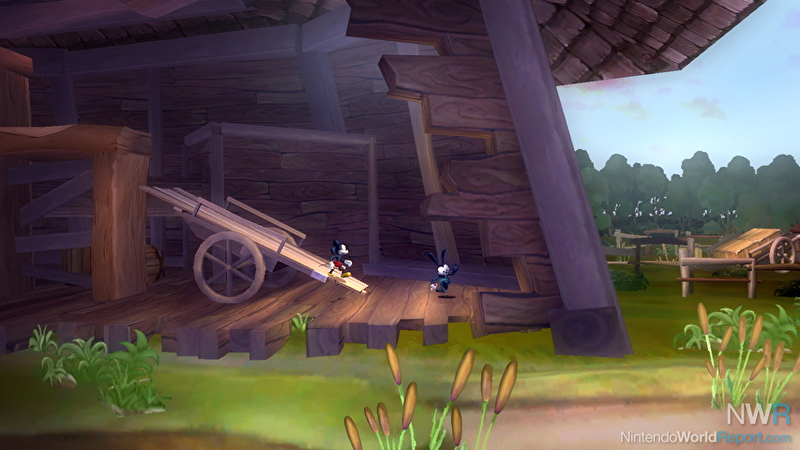 While Mickey uses paint and thinner, Oswald is more gadget-focused, manipulating machinery and flying over gaps to solve puzzles. Though cool in theory, playing with an AI is rough in practice. In some cases, your partner will just immediately solve a puzzle without any thinking process. Other times, the solution to a puzzle can actually be obvious, and Oswald just will not follow instructions. Twice over my playtime, I actually needed to plug in a second Wii remote and solve the puzzle myself. Even worse, the co-op puzzles are not very difficult and do not feel like the game-changer they could have been. The game revisits many locations from the first game in different forms, while introducing a few more. Although it is interesting to see old places again, it’s just not exciting to explore the same world again. With the exception of co-op, nothing feels fresh; the design doesn’t really change or improve, and it’s boring at times. Moreover, the dreaded fetch quests are still there, though they are thankfully a bit less required than before. In-between puzzles and 3D platforming are the same stylized 2D platforming segments from the last game. While they look as great as ever (especially the ones based on pre-1950s toons), they are still incredibly short and painfully easy. Although sheer charm forgave this issue in the original, it’s difficult not to be bothered with the issue now. Epic Mickey 2 is a game that prides itself far greater on Warren Spector’s goal of “playstyle matters.” The choices are supposedly more involving, with the outcomes being far more divisive, making the experience that much more engrossing. The experience is unchanged from the first Epic Mickey: if you do all of the side quests and be a nice guy, you will be rewarded as such. More opportunities to exercise whether you want to solve a puzzle using paint or thinner pop up, but outside of some dialog alterations, I never saw my play style mattering all that much, even during interesting dilemmas where it was easy to see both sides and the benefits for picking either. The camera has likewise been promised to be significantly improved over the last game, and improve it does. Similar to Super Mario Galaxy but not quite as polished, the camera does a good job of being in the right place at the right time. Somewhat unfortunately, however, the camera hiccups select spots (mostly in corners). Sometimes, Epic Mickey 2 is the prettiest game on Wii. The art style in cut scenes are great, and the CGI scenes are beautiful. When you actually get into playing the game, the graphics aren’t nearly as impressive. Jaggies are just a bit too prominent, and though it does not look worse than the original, it sure does not look much better. A more positive change for the game is that every single character is voice acted. Some may call the voices grating (and they are when they repeat an objective during a puzzle all too frequently), but I think they sound exactly the way they should. The new voice actors for Ortensia and Oswald are a little questionable, but they sound all right to me. Sound is a trickier thing to discuss. As a musical, Epic Mickey 2 sadly does not deliver. The smattering of tunes throughout the story is hardly enough to change the genre of the game. A few are good and well produced, but the vast amount of them is unmemorable. And ultimately, that’s my biggest problem with this game: Disney Epic Mickey 2: The Power of Two is just so unmemorable compared to the original. The new stuff is either bland or doesn’t work, and the level design is a little worse than in Epic Mickey. It is not a bad game, and is technically solid in most respects, but what could have been an incredible bookend to the Wii library is now a beacon of missed potential. I still believe that the concept art for Wasteland was more fantastic and engaging than the entirety of both Epic Mickey games thusfar. Dark, mashed together, and sinister- just the way the game should have been, if Disney wasn't so afraid of being frightening in the first place. Unfortunately what ended up being created was more of a love letter to Disneyland and a mostly uninspired trek through Disney history. It's a shame, because it had so much potential.